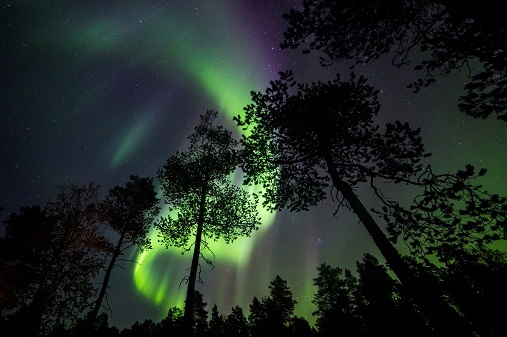 Autumn, in our opinion, is very possibly one of the best times of year to see the Northern Lights and yet it is all too often overlooked in favour of the snowy, and much colder, winter months. There’s no denying that here at The Aurora Zone we’ve always had huge success chasing the Northern Lights in September and October. While success is often in the hands of Mother Nature, there are several factors which combine to make an autumnal Aurora hunt a very compelling proposition. Research by Dr David Hathaway at NASA’s Goddard Space Flight Center based on 75 years of historical records led him to surmise that the months around equinoxes are almost twice as likely as solstices to have geomagnetic disturbances. We are fascinated by the mechanics behind the Northern Lights but sometimes the science can be a tad bewildering. So, please bear with us while we strive to explain the Russell-McPherron Effect. One of the causes of increased geomagnetic activity in March, April, September and October is the opening up of “Equinox Cracks”. These ‘cracks’ are caused by the interaction of interplanetary magnetic forces (IMFs) and Earth’s own magnetic field. Due to the tilt of the Earth and it’s alignment with the Sun around the equinoxes, these forces effectively funnel solar wind towards our planet creating weaknesses or “cracks” in the atmosphere. 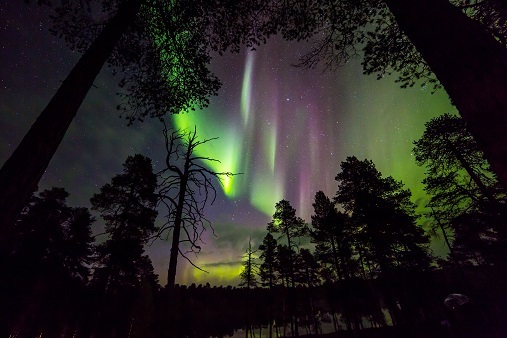 Therefore, during the months around the equinoxes, an increased number of collisions between solar winds and the gases in our atmosphere cause more Auroral activity than at other times of the year. That is our interpretation of the Russell-McPherron Effect, if you wish to delve deeper you can read Russell and McPherron’s full paper here. It is joked that “Ruska”, the Finnish Fall, starts promptly every year at 9 am on 9th September and lasts exactly two weeks. We think it’s a tad longer than that but for a few short weeks, what isn’t in doubt is that the landscapes in Northern Scandinavia enjoy all those lovely burnished colours of autumn. It’s a fabulous time to visit, with the landscapes changing colour by day and, very possibly, ethereal lights illuminating the skies at night. In autumn, the rivers and lakes of Finland remain open until the onset of winter’s big freeze. What this means is that you can very often see the Aurora Borealis reflected in the still, inky waters of the lakes and waterways. 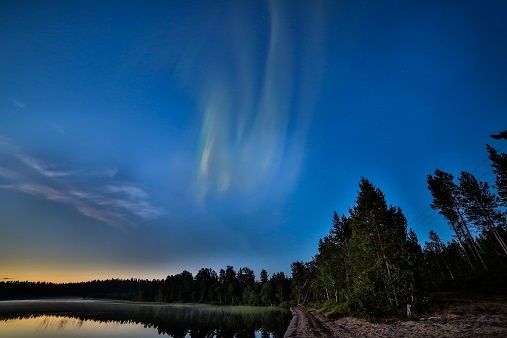 It’s an unforgettable experience seeing what is essentially two Auroras for the price of one and creates the kind of memories that never leave you. One of the almost inevitable things about Aurora hunting is that you need to be outside at night. When you are north of the Arctic Circle in the heart of winter it can get pretty nippy, as we are sure you can imagine. Of course, we provide cold weather clothing for these nocturnal outings but the cold is not for everybody. Indeed, a lot of people will go a long way to avoid sub-zero temperatures. 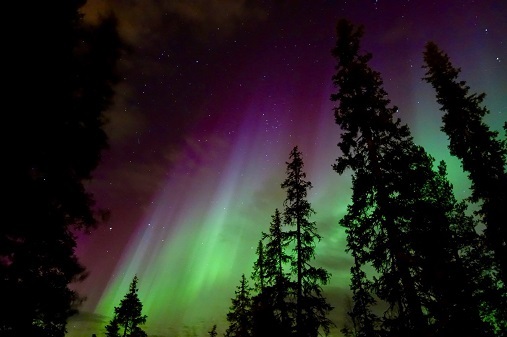 If you are cold averse, autumn is a far better time to search for the Northern Lights than in the depths of winter. It’s unlikely that the temperatures will be tropical, but they will almost certainly be considerably warmer than in January or February! If there is one thing an Aurora hunter hates it is blanket cloud cover. Autumnal weather in Northern Scandinavia is generally far more temperate than in mid-winter. 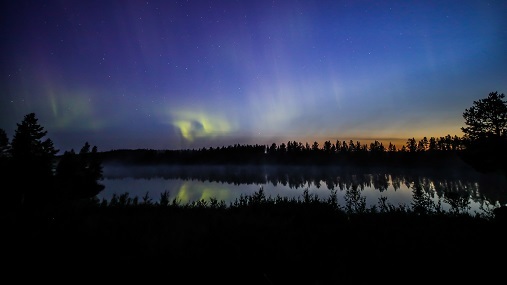 The likelihood, therefore, is that there will be less cloud cover obscuring Aurora displays in September and October. 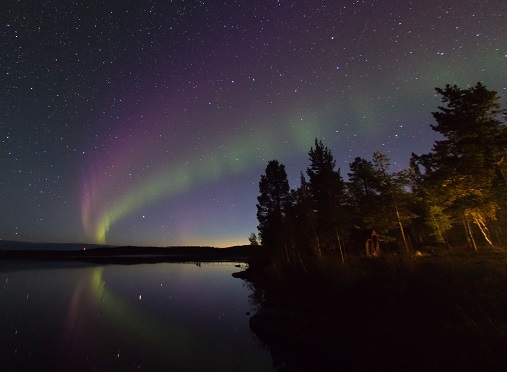 In places such as Finnish Lapland, autumn is very much seen as the ‘low season’ for tourists. As a result, experiencing a true Lappish adventure tends to be less costly than during the winter months. 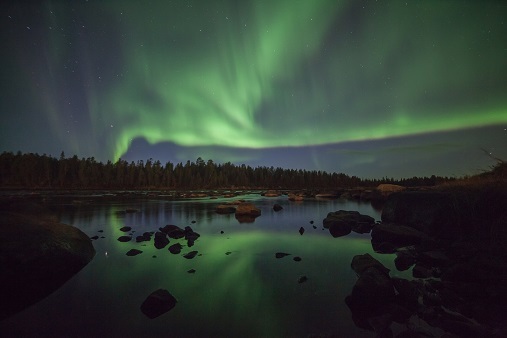 While the destinations we feature on The Aurora Zone are far from crowded, Northern Scandinavia is attracting more visitors each and every year, all eager to tick the Northern Lights off their bucket list. Autumn, however, still remains under the radar and chances are that you will travel in smaller groups and enjoy a more peaceful experience by virtue of travelling outside of peak season. Living off the land in autumn! As well as bringing some beautiful colours to the landscape, the Finnish ‘Ruska’ also brings with it some other delightful treats too! From seasonal berries to mushrooms, many of Finland’s forests become filled with some fantastic foods simply not available or accessible in winter. Indeed, this time of year is when the Finns stock up on such delicacies as cloudberries for the winter months. Many of our autumn holidays let you forage in the forests with a guide and our Torassieppi holiday even gives you the opportunity to attempt to catch your own fish from the lake! Feeling inspired by our 10 reasons? Click here to begin your autumn Finland adventure.